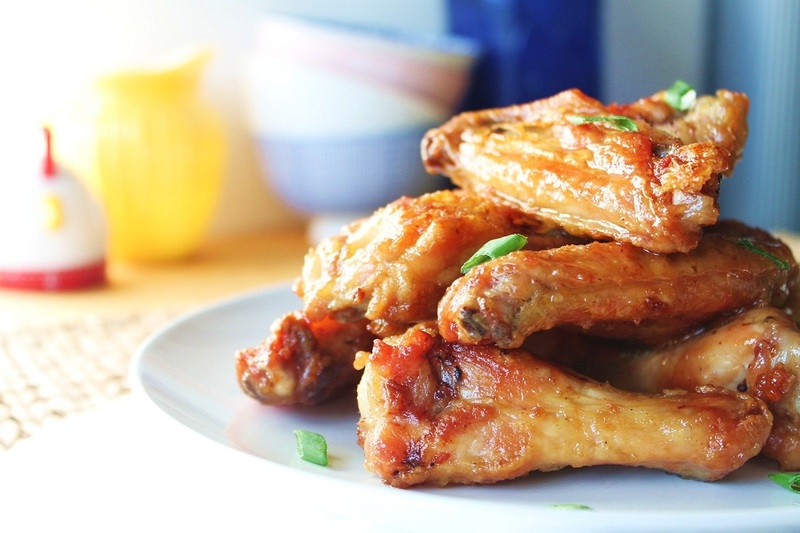 I only eat chicken wings on rare occasions, mainly because there is no place that is “safe” for me to eat them. Unless a restaurant has a dedicated gluten free fryer, which never happens…. I’ll be honest, most of the time when we make wings, I have my husband set up his fryer pot, that we use to deep fry our turkey’s (and yes it’s as amazing as it sounds). There is nothing quite as satisfying as fresh out of the fryer, crispy chicken wings. But sometimes its just not that convenient to do this, so I figured out a way to “oven fry” the wings and make them crispy. The trick is a super hot oven, a little bit of oil and salt and pepper. Another tip, do not overcrowd your sheet tray. The wings will start to steam rather than crisp up and then you will end up with a soggy wing (bleh!). Another secret I am going to share is my tasty glaze recipe. I’m telling you, it’s so good and good for you. That’s right, I said it, wings are good for you. Fresh ginger is key to making your wings flavorful. 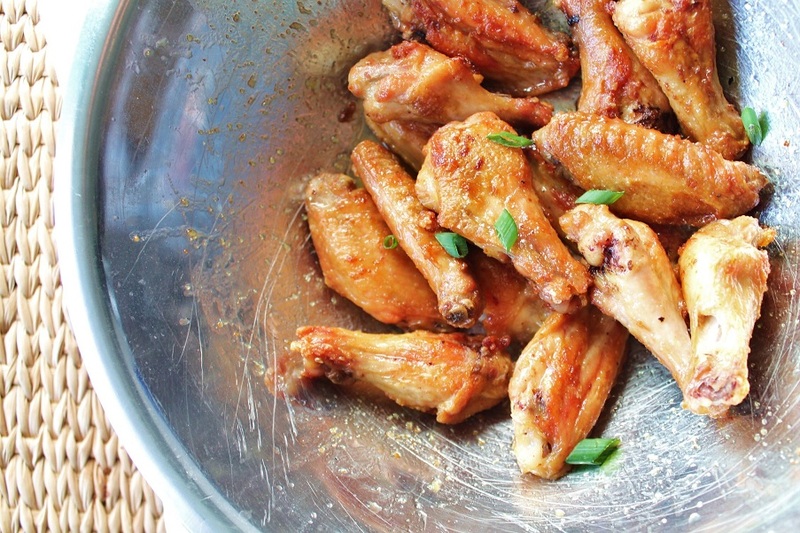 Coat your wings in olive oil and season with kosher salt. Lay wings in a single layer on your sheet tray. Bake for 15 minutes, then turn your broiler to high. Cook another 5 minutes or so until golden in color. Flip once during the cooking time so both sides get good color. Meanwhile, while your wings are cooking, prepare your glaze: Melt together your butter and honey. Whisk in the fresh ginger (starting with 1 teaspoon*) and salt. 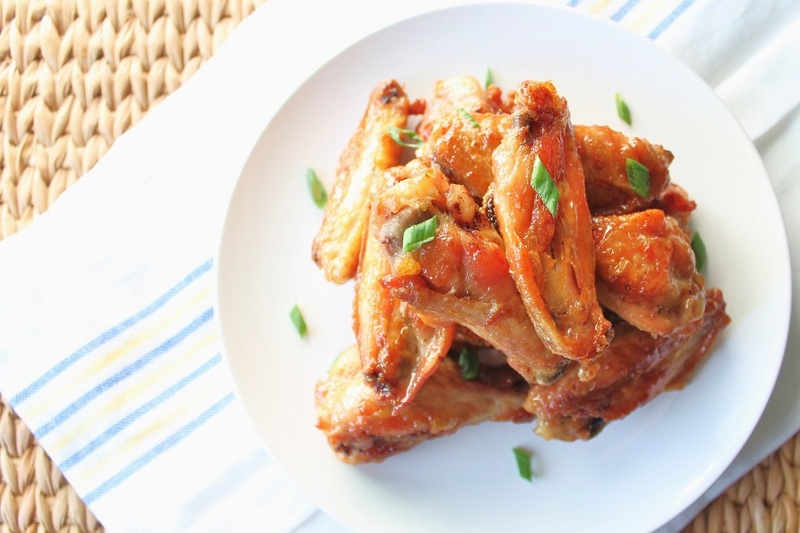 Immediately toss hot wings into your sauce in a large bowl, generously coating them. Garnish with freshly chopped scallions. Honey + Ginger combo sounds BOMB! Thanks for the crispy tips, hopefully my next batch of wings are crispy. We have started cooking our wings outside on the grill then spinning them in a bowl with the sauce!